I think birthdays and springtime (and birthdays in springtime) are a great time to think about all the things we love. When I need a dose of youth, I can draw from the positive energy of all that is good in my life and in my world. 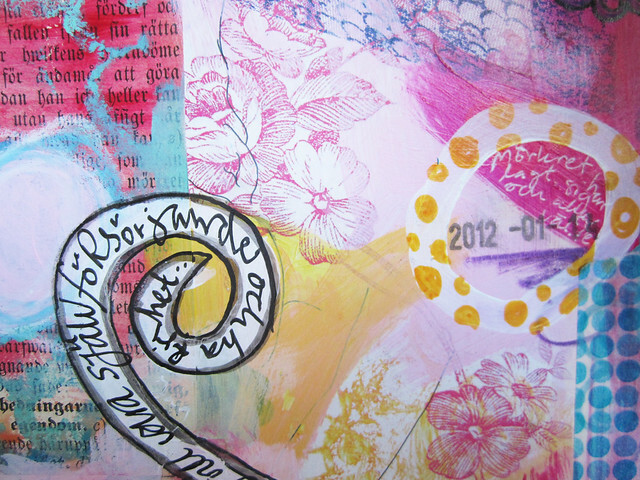 Doodles on acrylic paint, painted flowers, magazine image + quote, ink, pen, vintage text page, date stamp and washi tape. It’s about my endless fascination with circles and swirls. What patterns are repeating or reoccurring in your art/head? 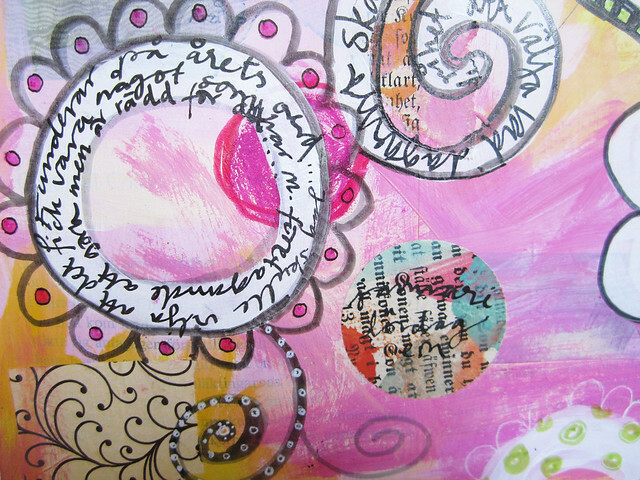 This entry was posted in Art journaling and tagged acrylics, art journal peek, circles, doodles. Bookmark the permalink. I love your colourful doodles Hanna!! I too have been doodle obsessed – last month was straight line mandalas and this month it’s been all about the fantasy flowers – repeating patterns trying to achieve depth and variation in line. It’s a lot of fun and I am really enjoying myself! I always love circles and swirls too. They seem to find their way into most of my work, although I’m not opposed to some nice grids as well. Aww, Hanna, I just made my husband pause the TV so I could tell him that you quoted me in your blog post…thank you!! Your journal spread looks amazing. I love circles and swirls myself, though there is the definite order of grids in much of my work. Very interesting to look for recurring patterns! I am really into drawing swirls & raindrops at the moment. There is just something about the shape of raindrops that I find quite relaxing to draw repetitively. They usually develop into a paisley type shape after drawing lots hehe. 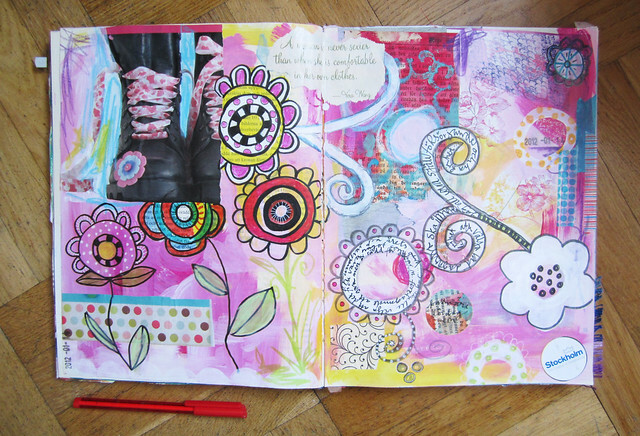 Beautiful journal pages, Hanna! I always look forward to your posts – your artwork never fails to make me smile! I love your use of bright, happy colors and your style in general. Thanks for bringing a big smile into my rainy day! Very beautiful! 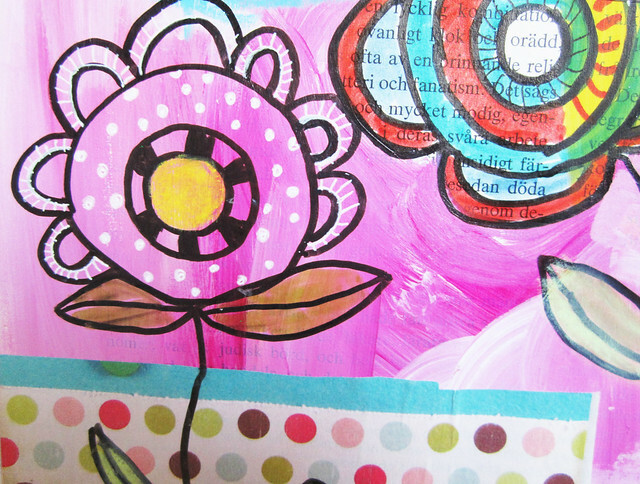 I love the mixed media, you’re art speaks volumes! Keep up the good work!